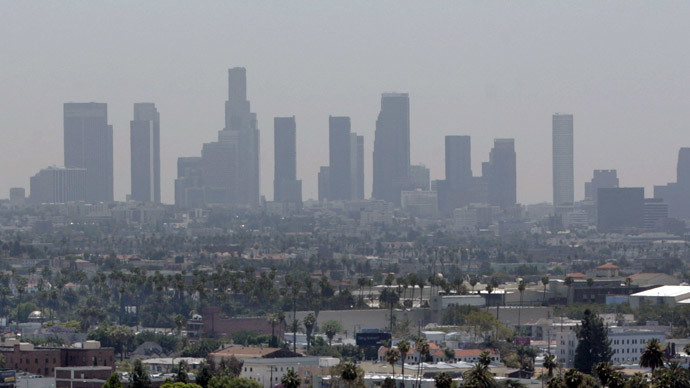 Severe drought is not the only culprit in California’s air quality woes. At least ten percent of ozone pollution in San Joaquin Valley originated outside the state, including particles from as far as Asia, researchers have found. Preliminary results of a three-year air quality study were presented Tuesday at a conference of scientists and regulators near Yosemite National Park, by atmospheric scientist Ian Falloona of the University of California, Davis. Another study by UK and Malaysian researchers, published the same day in Europe, showed air pollution from China could travel as much as 1000 kilometers a day during the “cold surges,” swiftly reaching the tropics. From there, it would be swept up into the stratosphere during the winter thunderstorms. “Traditionally, air pollution has always been considered an issue to be handled locally,” Falloona said, citing the example of California being divided into ‘air districts’. “But we’re going to have to treat air pollution to some extent how we treat greenhouse gases,” he argued. UC Davis researchers have been tracking the flow of air particles from a mountaintop station near Point Sur, and using an airplane equipped with scientific instruments. This enabled them to measure how much of the ozone in the valley was locally produced, and how much drifted in from the outside. The research showed 10 percent of the ozone in the valley actually came from elsewhere, including particles from as far as Asia. “We know these dust particles originated in Asia,” because they had different ratios of chemical elements than North American soil, Falloona told the Sacramento Bee. He added the composition of the particles indicated they came from factories and coal power plants in China. “It is critical to accurately identify the sources of ozone pollution so that solutions can be appropriately targeted,” said Seyed Sadredin, executive director of the San Joaquin Valley Air Pollution Control District, which funded the research. Air pollution is a serious problem in the valley, where cities of Fresno, Stockton and Bakersfield are located, with asthma rates twice the state average. Last year, the San Joaquin Valley had 99 days with ozone levels higher than the federal mandated maximum, ten days more than the year prior. Sooty particulates, which cause brown haze, were also up throughout California during the fall and winter, due to the unprecedented drought. Meanwhile, the Environmental Protection Agency has proposed tightening the federal ozone limits from 75 parts per billion to between 65 ppb and 70 ppb. A decision on the proposal is expected in October. “Air quality regulation is going to have to ‘grow up’,” he said.